538 Green Flash with a baby Green Flash behind. A nice line up of all the new red ones. As a slight update to the new Enviro fleet Plymouth Citybus 531 has now recieved the full Go Cornwall branding and 520 WG63HHY was in the workshops having the new Go Cornwall branding applied. I did notice something strange on Friday, there is a enviro 200 in the workshop with a swoop but also what looked like a white surround to is front and an unpainted front. I wonders if this was 142 having been repainted but I saw 142 yesterday. Is it one of 133-135? Is it 136 after repairs? It is 136. Recently moved over there after ages in the body shop repairing. are they keeping the go cornwall bus on them or just for photos ? From what we have heard 520, 531-536 all for 70/71 to Torpoint. The new buses and some older ones are working the 70/71 and 32. The routes interwork such that an incoming 70 or 71 goes out as a 32, similarly an incoming 32 goes out as a 70 or 71. So you will find the new buses on the 32 as well. Anonymous 22 Feb 2016 at 22:48...you are wrong, the original report is correct it is 520, 531-6 that have Go Cornwall fleetnames. 520 is in Go Cornwall Swoop! One of the 65plate Go Cornwall E400s currently off of the road as a result of accident damage sustained from hitting hedge/mud mound on entry to Raleigh inbound. Heavy damage to front left section, windscreen and doors smashed too. The damaged bus is 531. I just wonder what the next Flash colour will be? There are still plenty of colours - purple, grey, brown, orange, turquoise, navy should be enough. The bigger question is which key routes still remain to be flashed. The Citybus presence in both Ivybridge and Saltash has been reduced, so those are unlikely. Stagecoach is running Mount Batten and Tavistock, where Citybus beat a hasty retreat. What's left? Efford to Whitleigh? Egg Buckland to King's Tamerton? 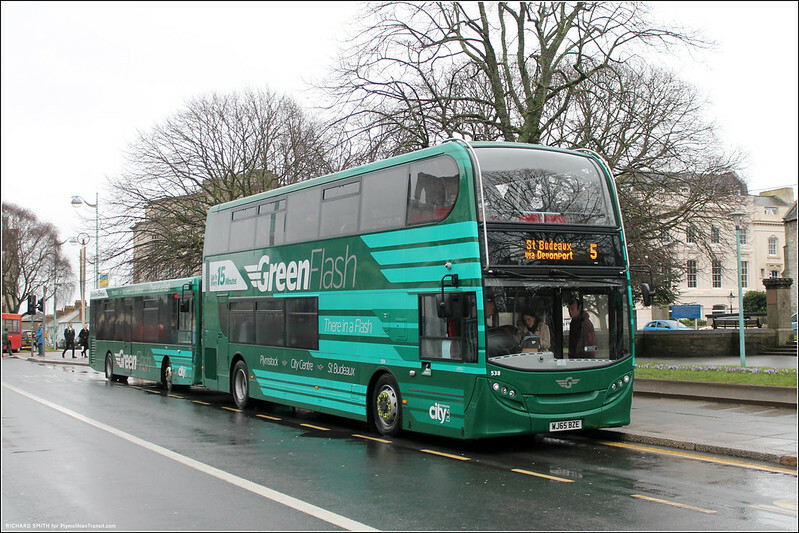 i was thinking the same, but plymouth citybus did already say the new 65 plate enviro 200s are for the 8/9 and 23/24 but if they made it a flash bus it could stay as them but repainted? but myself i was thinking the southway 40/41 as its a long route but maybe change the route to go along to milehouse and call it OrangeFlash?